So of course I still haven't quite caught up. (Sigh) Oh well, I'll just keep doing the best I can. June thus far has been a crazy busy whirlwind of activities for my kids. I am so proud of them both. My daughter is in the process of moving up a level in gymnastics, which means this mom's taxiing her to an additional practice each week. My son just had his spring concert. He plays the viola and it was just wonderful to see how much he had improved from the beginning of the school year. You can see a picture of our handsome young man here. There's been field trips and just the general rush to get all class work completed before Summer's arrival. There I go rambling again. Anyway, back to this week's ancestor. James Edward Harrison was one of my paternal grandfather Lemuel Harrison's brothers. I believe he was born in 1938 in New Bern, NC based on an entry found in the Whitney/Harrison family bible. Here's that entry. Page from the Whitney/Harrison family bible. The page shows two different birth dates for my grand uncle. What appears to be the original entry says, "Oct 24, 1938." 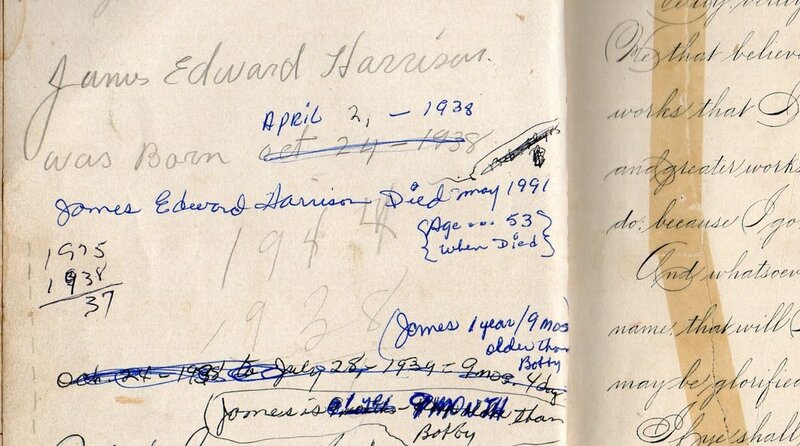 Then that date was crossed out in pen and "April 2, 1938" was written in. When I checked the Craven County Register of Deeds online site, they did in fact show his birth year to be 1938. The specific month and day I still have to determine. Well up until recently, the only things I knew about James were that he was close to his youngest brother Robert (Bobby), that he died in 1991, and prior to his death he was living in Baltimore, MD. Then came the release of Virginia Vital Records on Ancestry.com and then I was able to learn a bit more about James Edward Harrison. Source Information: Ancestry.com. 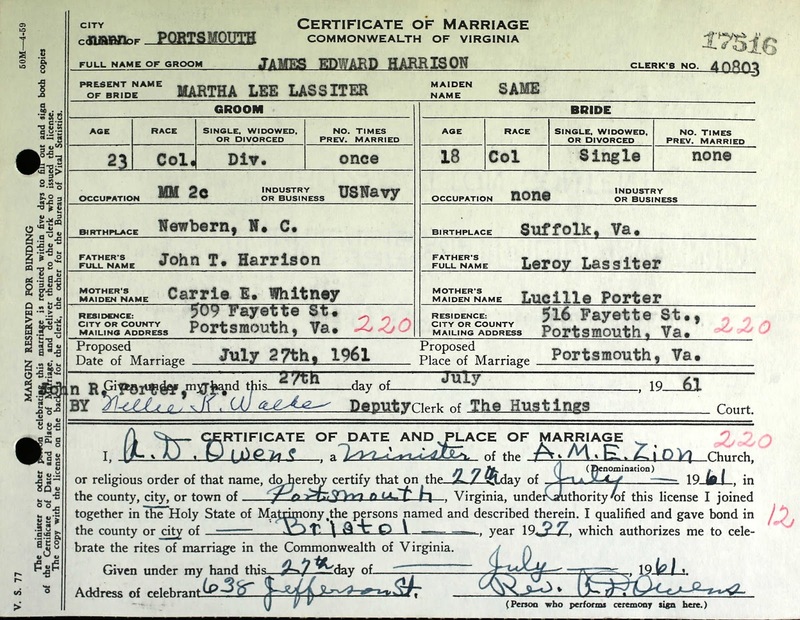 Virginia, Marriage Records, 1936-2014 [database on-line]. Provo, UT, USA: Ancestry.com Operations, Inc., 2015.Original data: Virginia, Marriages, 1936-2014. Virginia Department of Health, Richmond, Virginia. James married Edna Ruth Dees on December 17, 1960 in Portsmouth, VA. It was for both parties, their first marriage. Age: 22 --This corraborates information found in the family diary that James was born in 1938. James was a Navy man. His occupation listed here was MM-2. Of course I didn't know what that meant so I googled it. MM-2 is the abbreviation for machinist mate 2nd class. You can read more about the duties of a machinist mate here. Ahh...young love. How sweet. Edna and James. James and Edna. They married and were about to begin living "happily ever after." Then there was this. Source Information Ancestry.com. Virginia, Divorce Records, 1918-2014 [database on-line]. Provo, UT, USA: Ancestry.com Operations, Inc., 2015.Original data: Virginia Open Divorce Records, 1918–2014. Virginia Department of Health, Richmond, Virginia. Wow! 7 months. That marriage was certainly short. 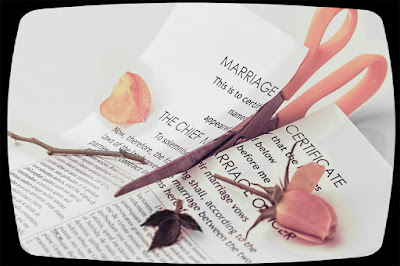 It looks like my grand uncle was granted a divorce due to his wife's adultery. At least that's what I'm guessing since James Harrison was the plaintiff. Edna Ruth Dees Harrison wed a Robert Gorman McCoy in Portsmouth, VA on June 4th 1962. 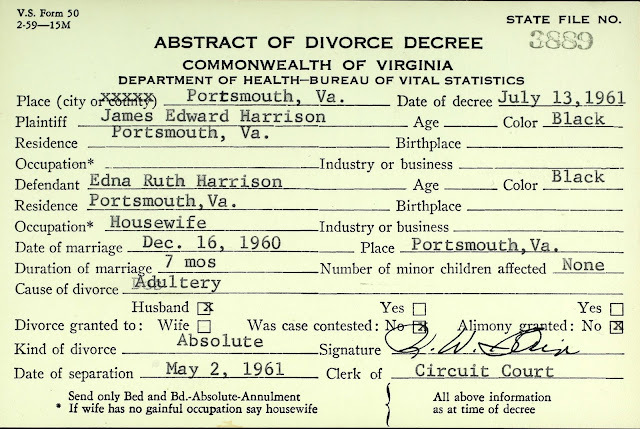 Edna's divorce from James Harrison was finalized on July 13, 1961. In less than a year she was married again. Perhaps this is the man she had a relationship with while married to James? That's just me speculating though. Love can happen when you least expect it right? It just seems to me that Edna remarrying happened rather quickly. Edna wasn't the only one who moved fast though. Source Information Ancestry.com. 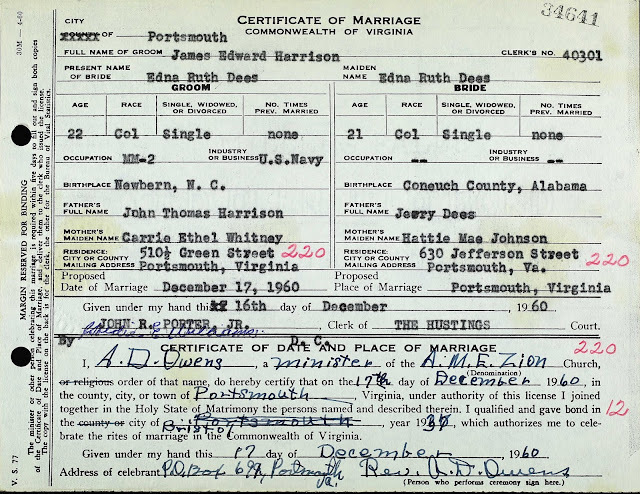 Virginia, Marriage Records, 1936-2014 [database on-line]. Provo, UT, USA: Ancestry.com Operations, Inc., 2015. Original data: Virginia, Marriages, 1936-2014. Virginia Department of Health, Richmond, Virginia. Wow! In some states you have to wait six months or something for the divorce to become final. I don't see how that could happen here since they were only married a year before being divorced. Maybe I better read it again, I might be missing something.